"History should be written as philosophy." 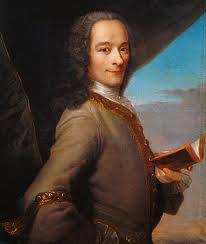 Voltaire, in many ways the paradigmatic Enlightenment intellectual, had a lifelong interest in history. And here, as in other fields, he was a severe critic of traditional ways of thinking. He wrote in response to at least two important strains of pre-Enlightenment historical writing. The first was the Augustinian tradition, whose last great exponent was the Bishop Bossuet(1627–1704). In that tradition, which we first find expressed by the Old Testament prophets, the historical field is a chaos of meaningless, purposeless events; only the chosen people—first Israel, later the Church—have an intelligible history, and the reason it is intelligible is that it constitutes the ongoing revelation of God to man. For such a scholar, history moves in rhythms as well as in a linear progression. In the first instance, the chosen people are rewarded for their righteousness, and punished for their wickedness, in generational cycles; in the second, history moves inevitably toward the eschaton, where the just and the unjust will receive their final rewards, and the reign of God will be established on earth. The second tradition that Voltaire wrote against was the humanist tradition of the Renaissance, which, following Plutarch and Cicero, saw the historical field as a reservoir of moral instruction. On this model Alexander, Caesar, Pompey, etc., were worth reading about because they had set an inspiring example for future generations to imitate. This approach to history may be characterized as vaguely cyclical, in the sense that it encouraged one to re-enact the past in the present, but it was not fundamentally interested in discovering the logic of events, or how the past had been transformed into the present.